Yay for America and Labor Day weekend! 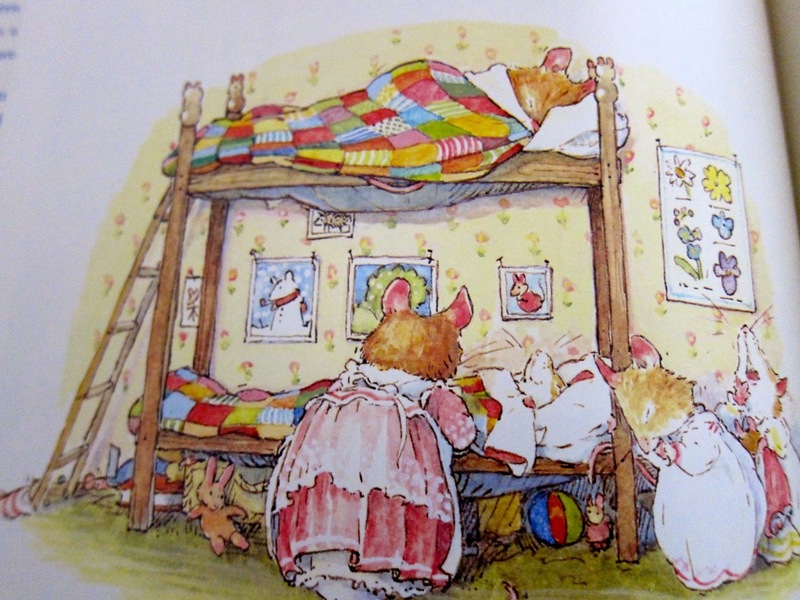 Do you wish you were going camping like these Brambly Hedge mice? I don't either. I do plan on doing a good amount of this! And this! I bet you love these illustrations as much as I do. Patchwork quilts, red dresses with white trim. White dresses with red trim. Botanical prints on the walls. I picked my pumpkin. It is almost September and it COULD freeze at night, right? It's far from freezing right now. Whew. My classroom was unbearable four of the last five days. Yesterday was cooler and Mrs. M was MUCH happier. Our Australian houseguest left a bouquet of mums. Pretty! This is the quilt my great granny made in 1968, when she was 85 years old. I have a square she gave me that I've saved all these years, so I shall make a pillow to go with it. I'm so glad my mama boxed it up and mailed it to me. We had five little girls over this morning. When I sit on the toadstool in the Wendy house, I can think of many ways to make it cozy. Bunting. Laminated pictures of the grands to hang on the woodsy walls. Tiny curtains. Dishes on little shelves. We'll see. And the lavender and rosemary are still looking lively. Bill filled all the bird feeders. Even though I have a fat bag of papers to grade, I'm home and home is the very best place to be. "One bright morning when my work is over, I will fly away home." 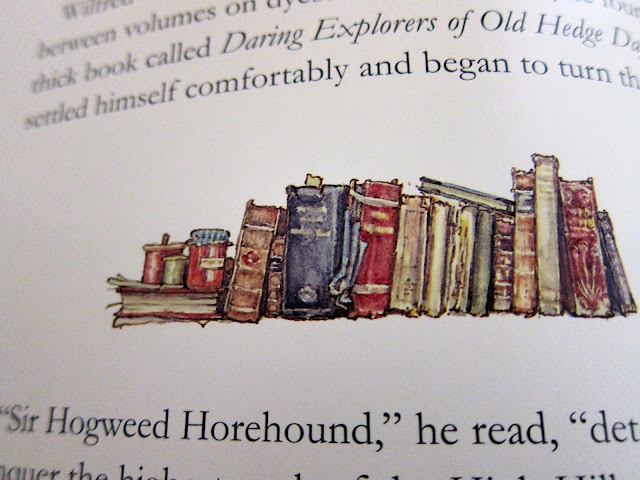 "Home is where the books are." Bless you and bless your home! I bought myself a little present. In the preface of The Complete Brambly Hedge, Jill Barklem discusses her vision for sharing the world of the mice with her readers. She sounds like an enchanting individual. I am delighted with this book full of industrious homemaking scenes. I'll share more soon. And this is just to say that rosemary and lavender growing in the garden is a whiff of heaven. My wish for you today: See things that are gentle and cozy so your heart will be soothed. Smell good natural scents so your mind will be light and know love. Yay! It's the weekend! My school bag is parked in the entry way of our house and I am sitting, dressed in my pajamas, listening to the birds tweeting. Ahhh! Bliss! Speaking of birds, look what my sweet mama sent me, along with a fancy new bird feeder that holds days and days of black sunflower seeds! Oh, the seasons of tomatoes and apples. Isn't God brilliant? Look at those reds! Red must be the happiest color of all, don't you think? Well, and then there's yellow. And green. And orange. Our Tasha Tudor's (giver of inspiration and imagination) birthday is this week! Yay for corgi dogs and sweet scenes of home! I am in awe of Mama Pumpkin! I DO like growing little pumpkins VERY much! It's thrilling! The sunbeams are on the sunflowers. August's corsage must be the sunflower. My nasturtium leaves are gorgeous this year. They have been a bit shaded and enjoying more water, thanks to the spray system. Fairy rugs! The birds are tweeting thanks as they swoop in to dine at all the feeders. Our Australian houseguest told me that he is a bit envious of my basil. He proclaims it plump and delicious! I spread pesto (yes, I really made some!) on french bread, placed a few basil leaves on top of a tomato and covered that with cheese and guess what? Yes. DELICIOUS! I'll dry some parsley, but I treat it like a flower and put bunches of it in mugs. It looks so green, so pretty. Plum Cake left her shoes here last weekend. I really should have taken them off the line because the sun faded the blue parts, but I liked looking at them hanging there, reminding me of all things Plum Cake! She took a step, by the way! Yay! Even though I sort of dreaded the end of August because it meant I'd be back at school full-force and NOT at home, the garden is lovely and ALL the flowers are bursting with joy. The students at school are adorable, sweet and shiny. I must spend some good time this weekend, pouring over their photos and memorizing all 120 names. Yikes! It isn't easy. 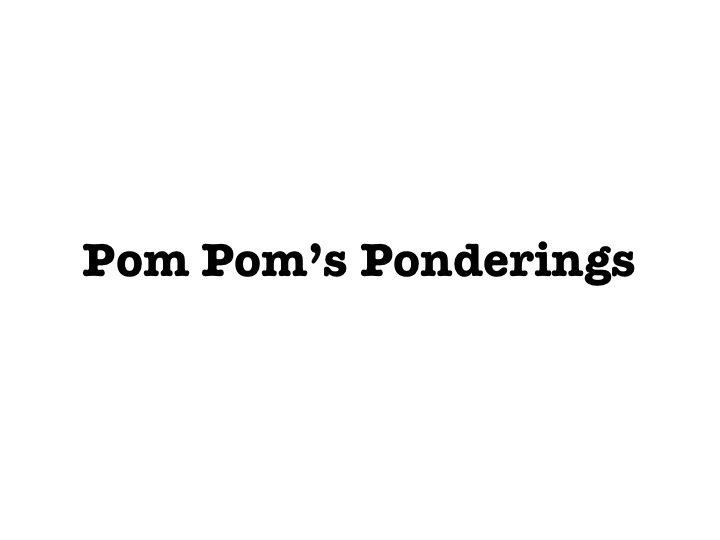 I have a lot of thinking and planning to do and I already have some grading to do. I'll get used to it. I hope your last week of August perks along nicely. Summer IS still in the air and it is meant to be loved. 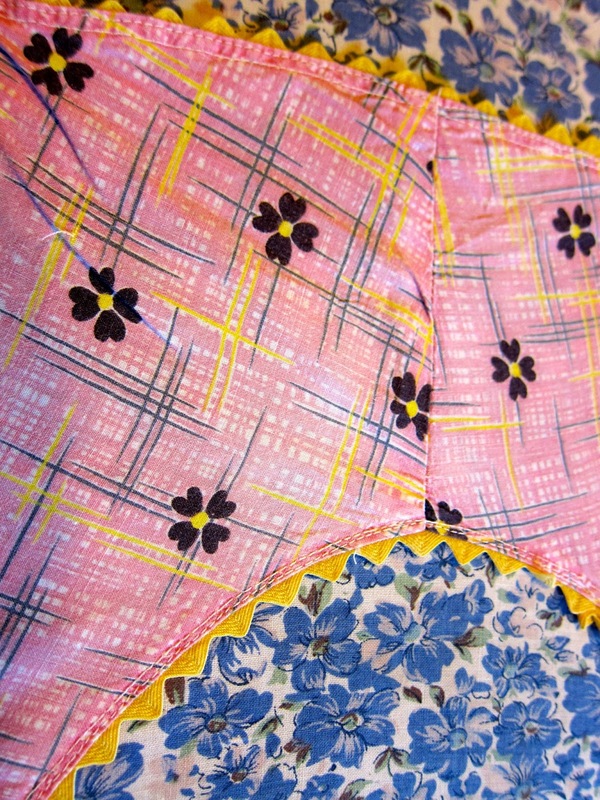 This weekend, when I was meant to be sewing curtains, I decided to iron old aprons instead. My mother-in-law was a tiny human, so the aprons I have that belonged to her are little and cute! The embroidery on this apron is so cheery! Little Blue (the iron - I just named her) is sweating with all the effort! 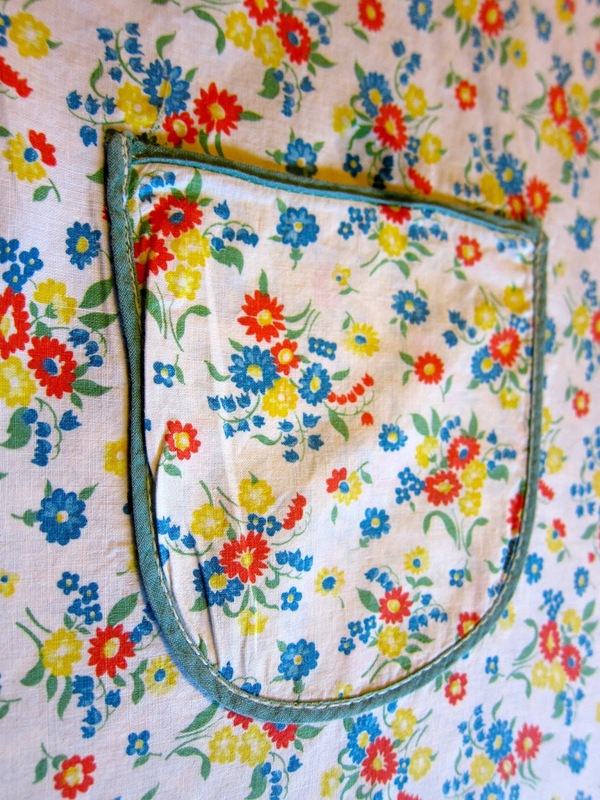 A pocket for a handkerchief! I like the rick rack on this vintage-print smock apron. Someone was a fine seamstress, don't you think? I find old linens so life-giving. I find ironing the most satisfying chore. No wonder I idolize Mrs. Tiggy Winkle. Now for the classroom . . .
Look at all the tissues the new students contributed to the class! I foresee lots of nose blowing! Do you like the tree and the homespun background? I admit the "theme" got a little crazy. The forest. Cabin. Cozy. Oh well. It all came together. And then we have mountains! Here are the owl curtains. Can you spot the toadstool? School is perking along just fine. The kids are VERY sweet! Finally, my classroom is fairly cool, too. I was so hot for the first few days. It's way too busy and that's always my complaint. I miss being home. I do go very slow at home and I can't go slow at school. I know heaps of grace will help me to adjust. My mom sent me another bird feeder and you should see all the winged friends flying around in our garden. Don't you love your birds? Thank you for dropping in to say hello! Ahhh, Saturday morning. After an exhausting week full of meetings and thinking, it's good to be home. I have sewing to do (owl curtain) and planning, but still . . . I'm home. Nice. The bunnies are dining on beans, but they left some for us. They must not like peppers and they can't make a dent in the parsley. Working with basil TODAY! I'm going to make pesto and serve basil leaves on tomatoes with fresh mozzarella. Not my tomatoes because as you can see, they are not quite ready to feed us. The sunflower group is reaching, reaching, reaching! When we put the drip watering devices in the garden, the zinnias were bumped, scooped, and scattered, but a few survived. Mrs. Pumpkin, why are you having babies on the birdbath? I'll take some nice pictures of my forest classroom (!) tomorrow when we go in to the school after hours to hang a big mural and finish getting ready for the kids. The owl curtains will be finished by then. It's time to sew. There are flickers (woodpeckers) out on the driveway and Bill is home from the Philippines. All is well. God be with you.